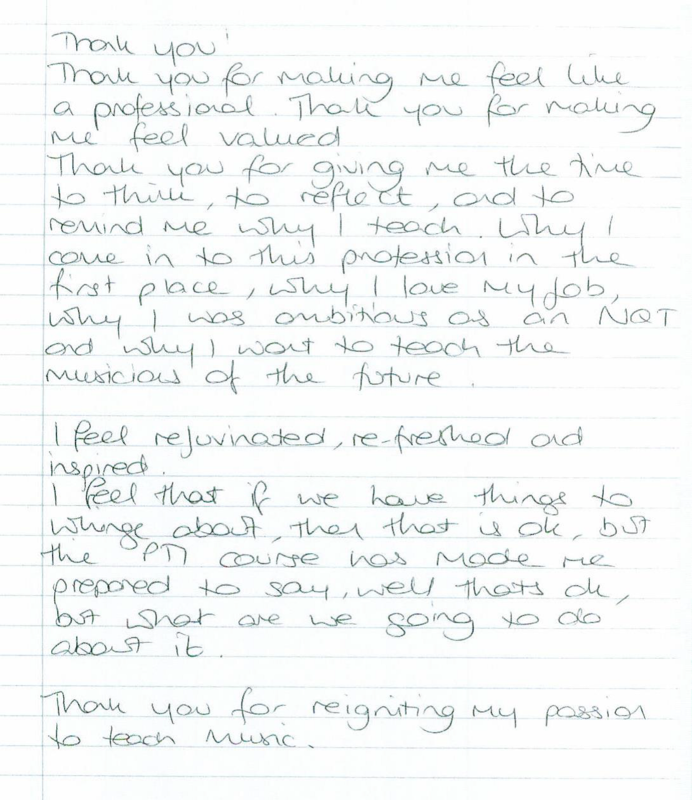 "I always leave SP days feeling a massive boost in my attitude to teaching my subject." "It was really lovely to listen to a lecture about something so different; it is not something I often get the time or opportunity to hear about and I really appreciated it." "We always strive to improve, and the PTI is an excellent vehicle for driving this forward in a way which is controlled, sustainable, and achievable." "Essential periods of reflection are afforded by being a member of the PTI and this is so integral to the continued well-being of teachers." "It is very important to my department to belong to the PTI. It supports us and upholds our beliefs in what it means to be teachers." "Excellent guest speaker - fascinating topic and a range of strategies to take back to school." "Fabulous to be treated like a professional." "A wonderful array of speakers and discussions that explored the breadth of my subject." "A time to reflect on teaching and reconnect with my subject, feeling respected and valued as a teacher." "Networking with fellow subject professionals is invigorating. I came away from the PTI course feeling encouraged, more focused, and with loads of new resources to share with my department/students." "(this residential has allowed me) time away from daily pressures to reflect. Networking as well as 1-1 discussion. Being treated like true professionals." "I think that teaching English is increasingly pressured and alongside pedagogy, data and other admin tasks, curriculum and subject knowledge training has become less important. PTI has allowed me to appreciate my subject again, which I feel I have lost due to all the other pressures in teaching." "Good choices of speaker. They were highly motivational. Also, as I am the only Latin teacher in my college, I value meeting other Latin teachers." "Very engaging speakers delivering varied and challenging subject content."